Arguably the top two hockey teams in the TVL met at a packed Loring Arena in Framingham on Saturday night for a big-time midseason showdown as the Ashland Clockers (5-2-1, 1-2-1) hosted the Medfield Warriors (4-0-1, 2-0-1). Thanks a late go-ahead goal by senior forward Stephen O’Leary with 2:50 to play, the Warriors held off the Clockers by a 3-2 final to remain unbeaten on the year. Along with senior captain Sean MacTavish serving up three assists on the evening, a main storyline of the game was how dominant Medfield’s penalty kill was; the unit finished the game a perfect five-for-five. Medfield began the game firing on all cylinders and set up a camp in the Ashland end, cycling the puck down low and dominating the time on attack. Just 3:35 in, Sam Palmer unleashed a clapper from the point thanks to a swift backhand feed from behind the cage by MacTavish to give the Warriors an early 1-0 lead. Ashland responded with a goal on a three-on-two at 11:33 to tie the game at one at the first intermission. Like in the first period, however, it did not take long for Medfield to strike at the start of the second, as Mike Tyer fired home the rebound of a shot from the slot by MacTavish just 2:01 in to give the Warriors back the lead at 2-1. Medfield’s penalty kill played lockdown towards the end of the period, killing off both Ashland power plays. Junior goaltender Mason Matthew made the save of the game with under a minute to play in the second, sprawling side-to-side from his stomach and blocker-ing away a rebound on a net-mouth scramble to preserve the 2-1 lead for Medfield at the second intermission. Just 34 seconds into the third period, Ashland tied the game at two via a rebound goal. The game remained tied at two despite Medfield peppering the Ashland cage with shots throughout the majority of the period. Finally, with 2:50 remaining, O’Leary broke through by taking a feed from MacTavish in the corner and firing home a shot low on the glove side to give the Warriors back the lead at 3-2. With 2:29 to play, Medfield’s penalty kill was again put to the task when Jim Cosolito was called for roughing on a big open-ice hit. However, the Warriors penalty killers, featuring junior defenseman John Schofield and junior forward Mike Tyer, were flawless, blocking a handful of shots and clearing the puck to kill off the penalty with just under 30 seconds to play. An icing with 1.1 seconds to play set up an offensive zone draw for Ashland and one final chance to tie the game, but Medfield stacked the front of the net with bodies and thwarted any sort of significant scoring chance off the face-off. The Warriors prevailed with the 3-2 win. 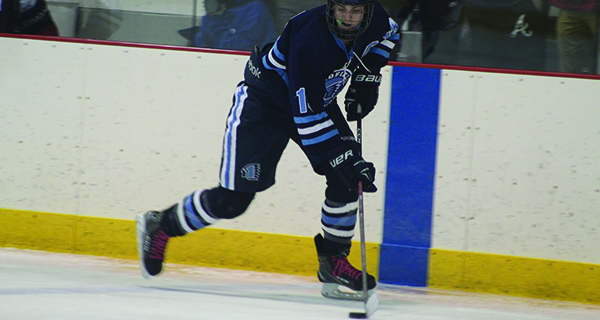 Medfield will look to continue their unbeaten ways against Dedham on January 9 before a meeting with rival Westwood on January 12.